Airplanes are the keys to the skies and vehicles for fulfilling dreams. We love all aircraft and own a few vintage birds. N411J, our Beech Aircraft Model 18 Twin-Beech, is the newest addition to the Half Fast fleet. Built in 1953, the Twin-Beech boasts two 450-HP Pratt & Whitney radial engines. Twin-Beeches were produced from 1937 to November 1969. Over 9,000 were built, making it one of the world's most widely used light aircraft. Sold worldwide as a civilian executive, utility, cargo aircraft, and passenger airliner on tailwheels, nose wheels, skis, or floats, it was also used as a military aircraft. Side note: Ellie Mae would like to point out that this is her favorite plane after she had us remove a seat to make room for her dog bed. Our Stearman 4E, N785H, was built in 1929. This 4E has been fully restored with its original Standard Oil of California Stanavo paint scheme. It has an upgraded 500HP Pratt & Whitney radial engine. The Speedmail was designed by Lloyd Stearman, who said it was the best airplane he ever designed. These airplanes were marketed as fast and luxurious executive transports and mail planes. Our Stearman, 806RB, was built in 1942. It is a PT-27 (rather than a PT-17) because it was part of the first set of Stearmans sent to Canada for primary training during World War II. 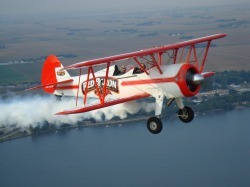 After the war, this Stearman was also used as a crop duster until the Red Baron Squadron rebuilt it and used it until the group disbanded in 2007. 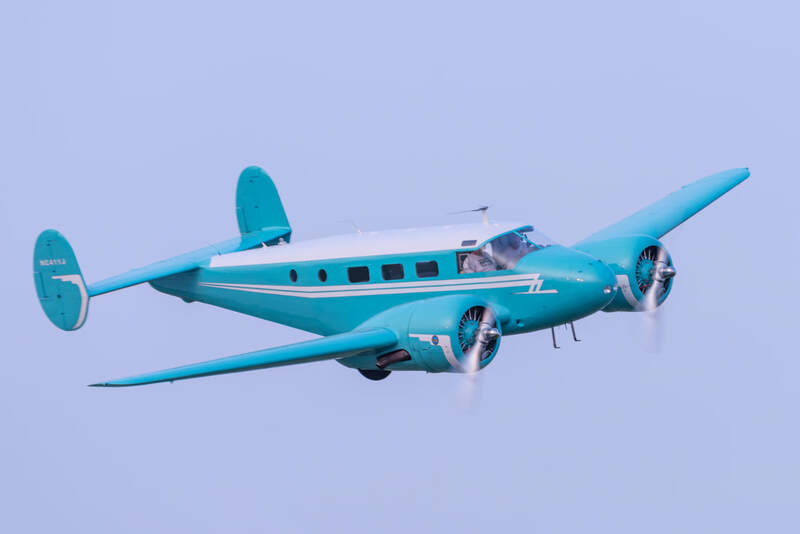 The plane has been highly modified, boasting a 450 HP Pratt & Whitney radial engine and inverted tanks, which means it's always up (side down) for a good time. Brian's Comments: "If you asked me before 2009 if I'd ever own an airplane with a picture of a man for nose art, I would've chuckled. But there's nothing feminine about this plane. It's like an old Harley Davidson that was too mean to stay on the ground. Instead of the rumble of potato-potato-potato, you get the hard-hitting growl of round 450 hp. The Red Baron is highly modified, and there's no maneuver that it will shy away from. Without a doubt, it likes to fly as much as I do." The Stearman Kaydet, a two-seater biplane introduced by Stearman Aircraft Division of Boeing in Wichita, Kansas, in 1934, became an unexpected success during World War II. Its simple, rugged construction made it ideal as a primary trainer for new American and some British pilots. The Stearman has fabric-covered wooden wings, single-leg landing gear and an over-built welded-steel fuselage. Only radial engines were used. Between 1936 and 1944, Boeing build 8,584 Stearman Kaydets. Stearman Kaydets were the most popular primary trainer during World War II by both the Navy and Army Air Corps, and the trainers were also sold to Canada, China, the Philippines, Venezuela, Argentia and Brazil for both military and civilian uses. Many were still in service in the early 1990s. Their slow, low-level flying capabilities made them particularly suitable for crop dusting and spraying. Our Tri-Champ was the fifty-third 7FC built by Champion in 1957 and used as a trainer, a club plane, and for personal enjoyment in Virginia, South Carolina, Ohio, and Indiana until it moved to our hangar in October 2011. Now, it serves as a time-builder and all-around fun flying machine for Rachel (and Brian when he can pry the stick out of Rachel's hand). 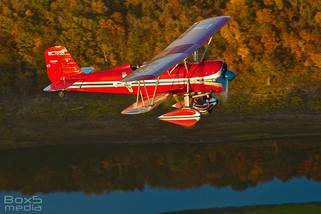 The Tri-Champ is the rare, oft forgotten stepchild of the Aeronca Champ. In 1957, Champion brought out the 7FC, with its unique tricycle landing gear arrangement. Cessna ended its production of the 140 in 1951 and switched to the tricycle gear 150 in the mid 50's. Champion wanted to compete for flight schools and added the nose wheel to the Champ. Production ran from 1957 until 1962, and only 472 were built. No United States military use of the Champion 7FC is known. Its “no bounce” oleo landing gear system made flight training easier, but the nose wheel was prone to buckle upon hard landings. Similar to other Champs, the 7FC used heel brakes. One distinctive feature of the Tri-Champ is its sensitivity to gusty winds. The tricycle gear sits the Champ fuselage higher, causing the 7FC to flip over with strong quartering crosswinds, requiring careful and slow taxiing.